Young wild roe deer in grass, Capreolus capreolus. New born roe deer, wild spring nature. Male European roe deer (Capreolus capreolus) squatting. Roe Deer buck (capreolus capreolus) foraging at forest edge - on camera. Roe deer feed on grass, herbs, leaves, shoots and berries. Only the males have antlers. Roe Deer doe (capreolus capreolus) foraging at forest edge. Roe deer are very shy and are active mostly at dawn and at dusk. Only the males have antlers. Roe deer in forest, Capreolus capreolus. Wild roe deer in nature. Roe deer in grass, Capreolus capreolus. Wild roe deer in spring nature. Roe deer in a snowy forest. Capreolus capreolus. Wild roe deer in winter nature. 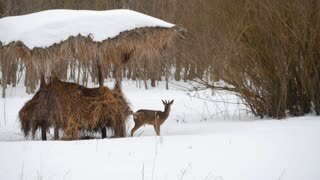 Wild roe deer in winter nature. Capreolus capreolus. Wild roe deer in winter forest. Capreolus capreolus.